A father is hoping to inspire change following his daughter's death after being hit by a vehicle in Phoenix last year. PHOENIX — A father is hoping to inspire change following his daughter's death after being hit by a vehicle in Phoenix last year. Kacie Clark, 20, was killed in January 2018 after a vehicle hit her while on the sidewalk near 19th Avenue and Indian School Road. "I wanted to come out this week to commemorate her because it's the anniversary of her death," said Jay Clark, who is visiting from Texas. "Since I was out here, it was like well, make it productive, do something about it." Clark met on Friday with Phoenix Mayor Thelda Williams to discuss pedestrian safety. Fifty-six pedestrians were killed in the City of Phoenix in 2017, and preliminary numbers provided by Phoenix police show that number soared to 105 last year. "If I look in the paper and find out hey, we halved our deaths...great," Clark said. "I was part of that hopefully, or just by luck or coincidence." The City of Phoenix launched a Pedestrian Task Force last year and has installed more high-tech crosswalks known as HAWKS. The issue, though, isn't isolated to Phoenix. 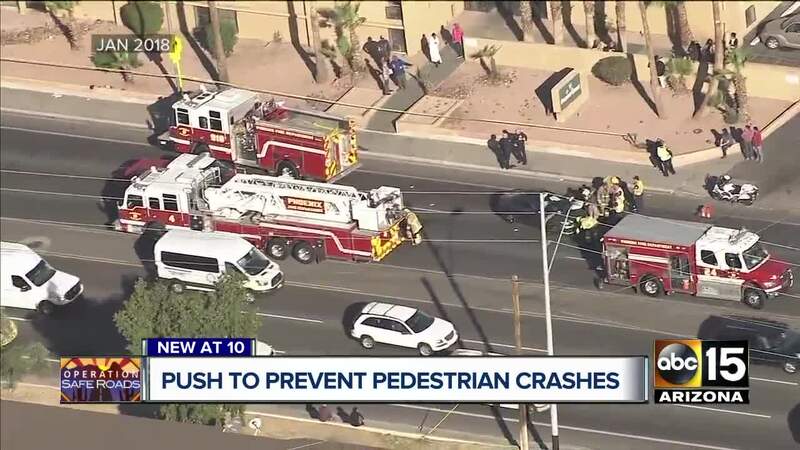 Over in Scottsdale, pedestrian crashes are a major concern. "We definitely want to reverse this trend," said Scottsdale Police Sgt. Ben Hoster. Use crosswalks when crossing the street. When there is no crosswalk present, cross the street at the nearest intersection. Wear clothing that is visible to drivers especially at night. Follow all traffic control signs and devices. Always utilize the sidewalk, if not available walk facing oncoming traffic.